It’s the season of life insurance investments. While most working professionals are on the lookout for ways to save their tax, life insurance companies have been invading all forms of media in an attempt to woo them. The idea is to leave the maximum impact while differentiating themselves from the clutter. But, how much ‘different’ can one be, when it comes to selling life insurance? The recently launched, “Apno Ko Apne Dum Pe Jeena Sikhao” is one campaign by HDFC Life that makes sure to leave a lasting impact. Powered by a long format 3-minute film, it features a heart warming story of a father and his beloved daughter who dreams of being a dancer. Her prosthetic leg never comes in the way of her dream, as the encouraging father instills a habit of independence and self pride in her. 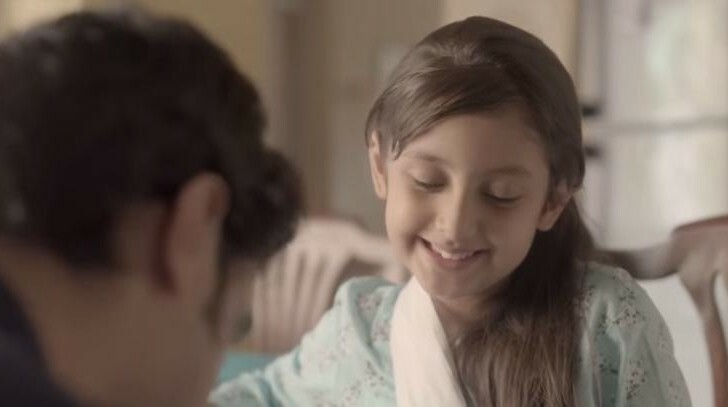 Conceptualised by Leo Burnett and directed by filmmaker Vikramaditya Motwane with music composed by Hanif Shaikh, the film opens with a little girl being awakened lovingly by her father and then having breakfast together before fixing up her artificial leg. We see the two go to a dance class where she insists he put on the dance anklets for her, while he argues that she should do it. She promises she would do it the next time. On the big day when she has a group dance performance on stage, he isn’t there to tie up her dance anklets. While she was accompanied by her grandma, he had deliberately excused himself with some work. After waiting anxiously for him, she ties it up herself just before the curtains go up. The father is actually standing backstage, as her performance goes on. It is only when the performance ends to a loud applause and the curtains come down, that she sees her father backstage beaming with pride. The two get into a tight hug, as the narrative says later, “Apne parivaar ko apne dum pe jeena sikhao…sar utha ke jiyo’. The hashtag #MyFamilyMyPride is displayed at the end. Well aligned with the brand proposition, ‘Sar Utha Ke Jiyo’, the film has earned positive appreciation for the brand, including the likes of veteran actor, Anupam Kher. The actor has called it a great film that portrays the father-daughter relationship beautifully. Uploaded on HDFC Life YouTube channel, the video has garnered more than 145K views in 5 days. Social media was leveraged in a creative manner to build curiosity about the story of a little girl and how she achieves her dream with a supportive father. HDFC Life began sharing teaser visuals on its social media pages, prior to releasing the ad film. Each of the visuals shared on its Facebook and Twitter pages took the story forward, while creating buzz for the new ad film. The campaign hashtag #MyFamilyMyPride is a strong message in a country that swears by its family. Moreover, the story line has all the elements required to get you to watch it again and also share it with your family. The father-daughter portrayal in this film isn’t one of the stereotypical run-of-the-mill stories in which the father is seen pampering the daughter to the point of which she hardly achieves anything on her own. The father’s way of gently pushing her to be independent from a young age sends a strong message to all fathers about the mortality of life, and the arising need thereby to insure themselves. The long format also works for the storytelling. The film manages to put the focus back into the unpredictability of life and the importance of family pride, but it does that in an appealing way. Coupled with the teaser promotions on social media, HDFC life has put up a memorable campaign – also in line with its brand promise.